We've seen pickle cupcakes, pickle flavored soda, and even pickle sandwiches, but this unusual pickle confection truly takes the cake, er, candy. This isn't the hot pink cotton candy you are used to. No, my friends, this pickle cotton candy is one-of-a-kind and you can't get it at the circus or amusement park. Cotton candy has been around since the early 1900s when a dentist (there's nothing more ironic) started selling the flossy sugar at the World's Fair. Selling the treat for only a quarter, the dentist sold over 68,000 boxes of the sweet stuff to hungry fair-goers. Since then, Americans have had a fascination with the fluffy candy, eating it up at amusement parks and even making it at home with small cotton candy machines. I love my #picklecottoncandy @s_sandusky87 !! Grandpa Joe's Candy Shop is filled with every kind of candy you can imagine. From hundreds of different glass soda bottles to retro candy you grew up with, this locally-owned candy shop in Pittsburgh has over 15,000 pounds of candy in stock. And one of those candies just happens to be dill pickle cotton candy. Sold under the name, Dilly Pickle Cotton Candy, this wildly addictive pickle candy promises to take your tastebuds on a little adventure. The website shares, "If you Relish all things Pickle, than this is a really big Dill!" and we can't help but agree; everything is better with a little bit of pickle juice. 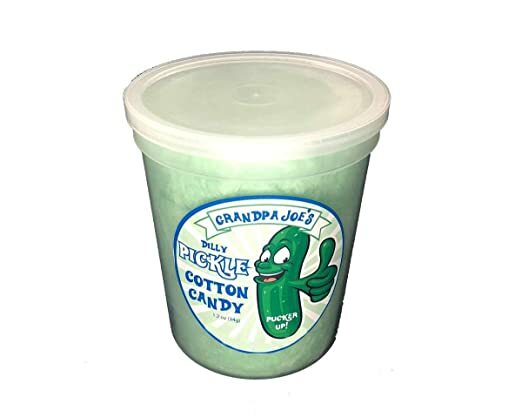 The pickle cotton candy is hand-spun in small batches and is served in plastic tubs. Pickle lovers can appreciate the hint of pickle in this real treat. One Amazon reviewer shared, "Sent it to a friend who LOVES Dill pickles as a challenge. And she LOVED IT!!! She said it had a Sweet Tart taste. Fun!" It's got a taste you've just got to try.